Modibo Touré, Special Representative of the Secretary-General and Head of the UN Integrated Peacebuilding Office in Guinea-Bissau (UNIOGBIS), addresses the Security Council. 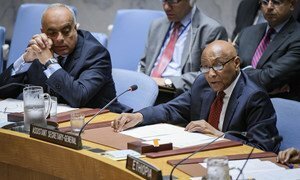 Only by fulfilling the minimum conditions of the Conakry Agreement can Guinea-Bissau make progress towards breaking its years-long political crisis, the United Nations envoy for the country told the Security Council today, calling for better coordinated, sustained international involvement. Modibo Ibrahim Touré, who heads the UN Integrated Peacebuilding Office in Guinea-Bissau (UNIOGBIS), said tensions reached a new peak three months ago, leading the Group of International Partners [African Union, Economic Community of West African States (ECOWAS), Community of Portuguese Speaking Countries, European Union and United Nations] to publicly express concern over increasing inflammatory rhetoric and the threat of violent demonstrations. In recent weeks, he said, dialogue aimed at resolving the political impasse within the framework of the Conakry Agreement had resumed between the parties. Looking ahead to legislative and presidential elections scheduled for 2018 and 2019, respectively, he said requisite measures must be taken to create an environment conducive to the holding of free, peaceful and credible polls. Uncertainty over how to resolve the political crisis could undermine the overall stable situation in Guinea-Bissau, said Ambassador Elbio Rosselli of Uruguay, Chair of the relevant sanctions committee established pursuant by the Council in 2012, warning that ambiguity around the division of power between the President and the Prime Minister has created uncertainty. “International and regional efforts to find a solution appeared to have had no impact,” he said, as no provisions in the Conakry Agreement had been implemented, in large part due to a lack of political will. While there are no clear signs that substantive progress would soon be achieved, the security situation remained stable. However, the patience of the army and the population could run out at any moment. Stressing that the meetings he had held during recent visits to Guinea-Bissau and Portugal highlighted the complexity of the situation, Ambassador Mauro Vieira, of Brazil, Chair of the Guinea-Bissau configuration of the UN Peacebuilding Commission, said the Conakry Agreement remains a fundamental reference point for most political actors – as well as the subject of conflicting interpretations. He said one group believed there had been no agreement on who should have been appointed Prime Minister, while a second group believed that one name had in fact been agreed. Some felt that the African Party for the Independence of Guinea and Cabo Verde no longer controlled the National Popular Assembly, while others said that the 2014 elections had given that group a majority that could not be changed through the creation of a block of 15 dissident parliamentarians. “I did not find those different positions moving closer together,” he said, noting, however, that leaders of the armed forces had reassured him of their strict respect for constitutional order. United Nations Security Council sanctions are “a formidable instrument for global peace and security,” a senior UN political official said today, stressing that these measures, when implemented effectively, can contribute to preventing conflict, countering terrorism and constraining the proliferation of nuclear weapons.